In some far off place, many light years in to space Le Sony’r Ra rests, having accomplished his 79 year quest on the planet we call Earth. Sent by the Master Creator of the Universe, the Cosmic Messiah entered our dimension as Herman P. Blount, emerging in Birmingham, Alabama – one of the most racially segregated cities of America at a particularly punitive period of oppression – 1914. Though initially unaware of his celestial duties, the musical capacity granted to him by omnipotent forces became evident very early on in his life – by the tender age of 12 he was already writing original music. It wasn’t until his college years however, that he became aware of his ethereal responsibilities as he was transported through a giant light beam to Saturn and warned of the Earthly chaos that lay ahead. 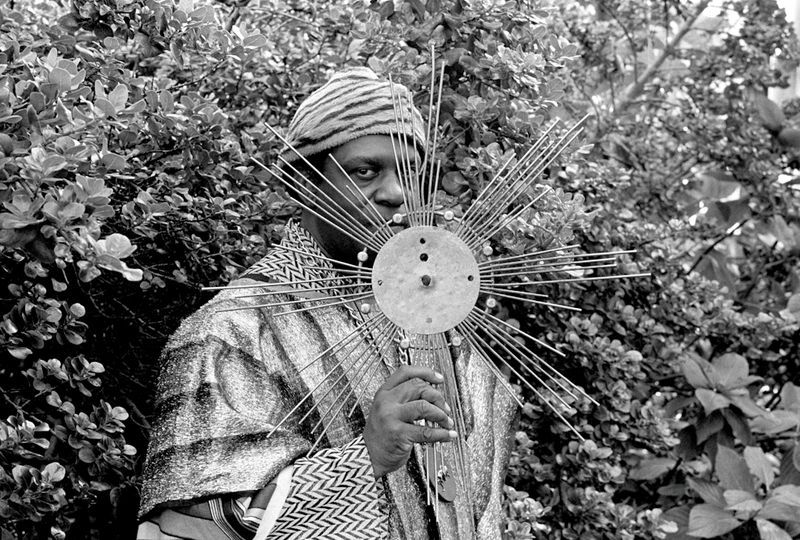 Injected with otherworldly wisdom, Blount returned to our planet as SUN RA and armed with an idiosyncratic blend of space-age science fiction and ancient Egyptian cosmo-religious trappings, he set about constructing a counter-myth to the orthodox theology of the Bible – a book that had been used to justify the enslavement of his people. Using his band – THE ARKESTRA – as a medium to spread the stellular message, he ensured that only the right kind of open-minded people heard his teachings by operating outside of jazz’s established dogmas and hip movements – choosing instead to compose challenging arrangements featuring extensive percussive solos, raucous counter melodies and off-key horn barrages. Although he left our dimension 20 years ago his legacy lives on, not only through his extensive back catalogue of around 200 albums but also through the countless artists he influenced. At every corner of music’s vast spectrum – from soul to funk, trip hop to techno, dub and metal, Ra’s avant-garde imprint can easily be detected. Paying homage to the Cosmic Pharaoh, Le Sony’r’s disciples at A Culture Less Ordinary, Rebel Soul & Carnivalesque have organised an extra-dimensional TRIBUTE to the virtuoso philosopher’s work and legacy; bringing an interstellar line-up to Liverpool’s astral hub, the Kazimier on 31st August. London’s cosmodelic afro-punk four-piece, UNITED VIBRATIONS make their return to Liverpool for this interplanetary undertaking as do Manchester-based SPACEHEADS – a duo who manage to create vast and complex soundscapes with nothing more than a drum kit, a trumpet and electronic manipulation. Home-grown groove generators WE, THE UNDERSIGNED and THE HARLEQUIN DYNAMITE MARCHING BAND have too been drafted in to pay reverence and will be joined on the roster by the brainchild of Homelife’s Paddy Steer and 808 State’s Graham Massey; THE PART TIME HELIOCENTRIC COSMO DRAMA AFTER SCHOOL CLUB.